Hey! Hey! I am not dead, in fact I have been on a baking spree for the past week and a bit. After making over 5 or so batches of 100 and something shells for macarons filling and stuff; I had two order for petit fours AND a birthday cake including mini cupcakes! Woo!!! Things have been looking up for me and my rep among the neighborhood for baking. At least they will not think I am weird any more for the smell of bread and other baked goods wafting out the house at 2am in the morning. No I am not on the drugs; unless you count ice cream and espresso as a drug. My series of petite fours from here, to this chocolate load sweetness and the all classical Aussie slice. I have also made macarons for this order too but really with the amount of picture on the internet I think I will save you guys from ANOTHER typical pretty, pretty picture post. See this link; My very imperfect photo of a foot ball ball cake I have done for an order. Bad, bad lights and other photo sins. Answer me this Instagram photo genius, How do you make them look so perfect??? Even though Winter had truly settled in to Australia; I will never, never stop making ice cream. Now ice cream is one of those things you can have may paths to greatness but you also have many sins that can be committed against it. 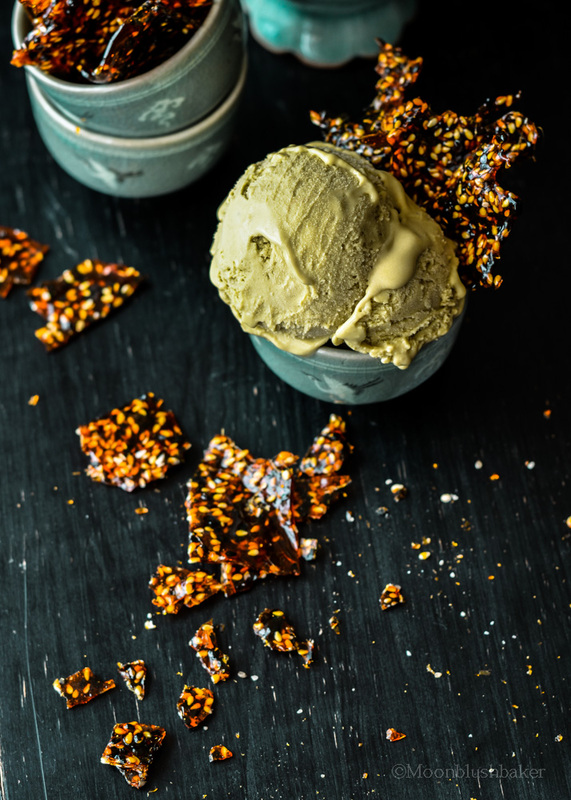 Even though we all know that Jeni’s ice cream base with her magical formula for an eggless ice cream is a worldwide favourite; I still cannot go past the egg yolk base ones. It is either I have a taste of massacring little chickens or my taste buds are more catered for the creaminess that you get from the natural properties of egg yolk. One flavour my family and I cannot get enough of is green tea. 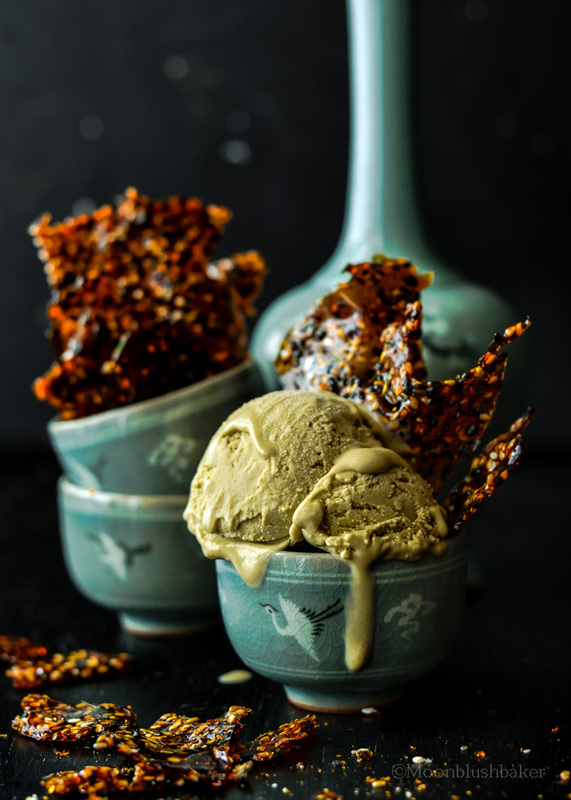 I am not sure how to describe green tea when you put in ice cream; I am lost for words. May be I am too entranced by the cream taste to pay attention. 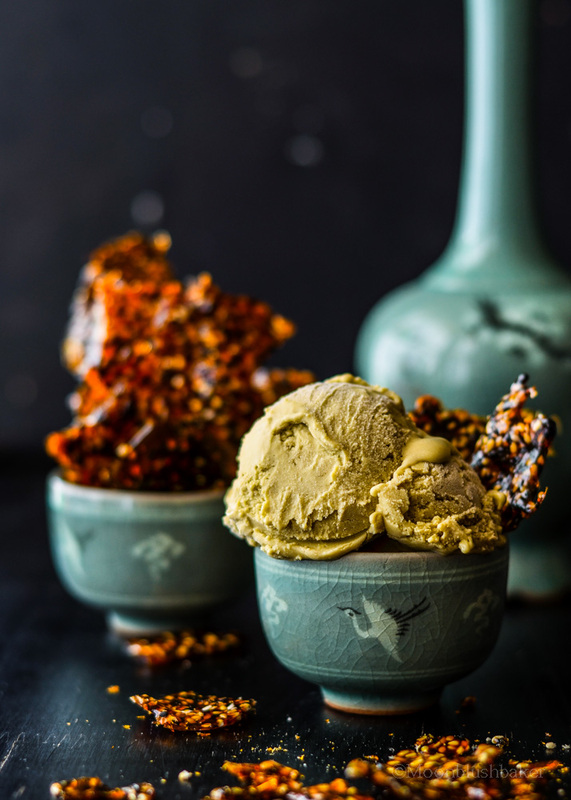 The Smokey depth of green tea helps to cater for less sweet tastebuds but I just love the colour it gives to a sweet ice cream base. While the additional jasmine infusion is not necessary; I have recently turned for this tea bag infusion. The light floral fragrance of jasmine is actually sweet compared to green tea; so I guess this help balance it out. The base is a typical crème anglisese base which you know will make a creamy, smooth ice cream. 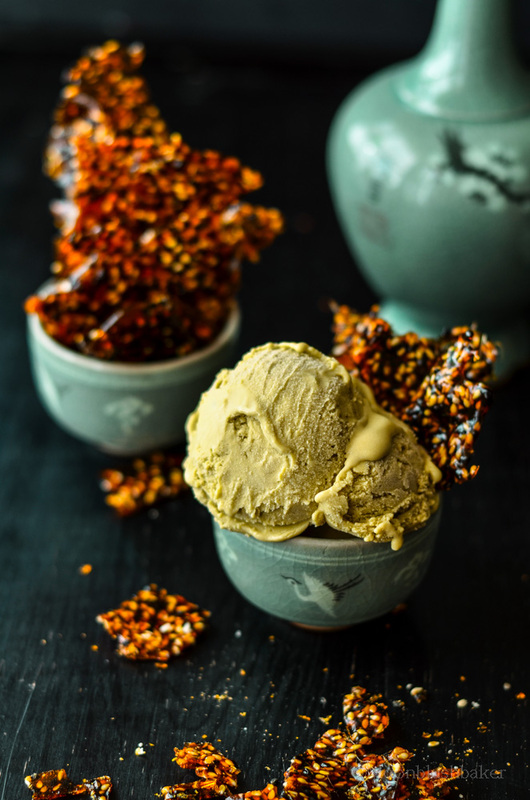 You will need a domestic ice cream maker for this; however by my research around the web you can also freeze it for a bit (maybe an hour) then take it out and blend it again. I have not tested this way but if you do let me know! 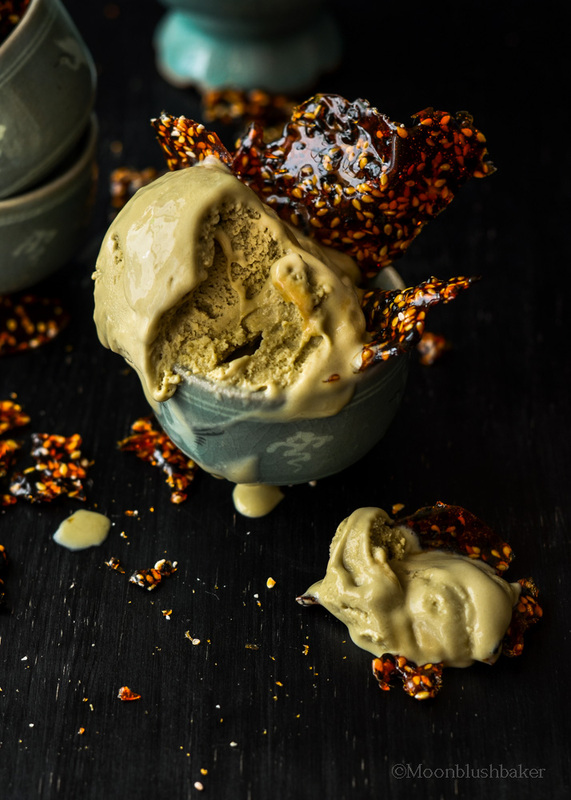 Infused Green tea ice cream sundae with double sesame brittle. Combine milk, cream and matcha in a large pot over medium heat. Bring to boil and add the flower. In large glass bowl, whisk the sugar and egg yolk to light and fluffy. While whisking at the same time pour the hot milk in thin stream into the egg mix. By tempering the eggs first you avoid the curding effect. Pour this mix back into the pan and place over medium heat. With a wooden spoon mix constantly but slowly with a wooden spoon. Continue to mix in a figure 8 motion so bubble with disappear and it will thicken. The crème anglasie is ready when the reaches 80 degrees on a thermometer. Pour the anglaise into a metal bowl sitting a bowl of ice water and stir it until it is cool. Strain through a sieve and set it covered the fridge for 1 day. Place your ice cream maker in the freezer and churning the next day according the instruction of your machine. In a small sauce pan bring to boil the sugar and water, put it over medium heat. DO NOT TOUCH IT THIS POINT. Wait until it turns a deep golden brown before stirring in the seeds. Immediately pour on the lined tray and leave to set but snapping in to pieces for your ice cream. Wow loving this sesame brittle!!! Beautiful pics as always! The brittle is my fave part about it. It is so addictive. What an amazing dessert!!! 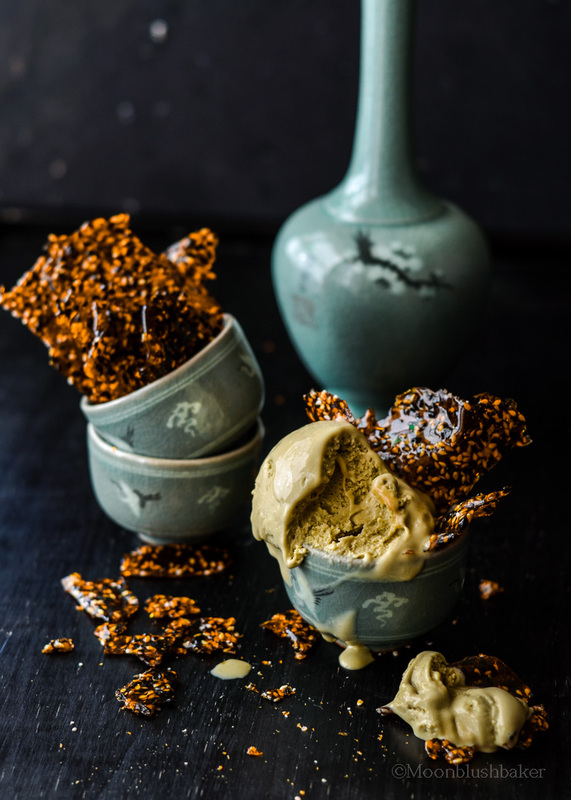 I could eat the ice cream and the brittle separately but together is just pure heaven! Lovely, lovely photos! Thanks for the pin love! I LOVE green tea ice-cream!! I don’t consider any restaurant properly Japanese unless they give me green tea ice-cream for free at the end. Yes, has to be for free… I’m sure this is unheard of in Japan. And with those sesame brittles? Get out of here! For free? You are living the dream! I wish I got it; it costs $5 a pint here. Wow, you have been super busy, but that sounds amazing and delicious! If ice cream and espresso are a drug, I’d be on drugs everyday. I’m trying to visit Australia this December, too! Thank for your Understanding! Yep I am drugged out on ice cream all the time; I hope you like Australia it will be hot and sunny when you visit. Thanks Karly! I never miss one looking at one. Oh I wish I was in your place right now; it is freezing in Australia!